A photo provided by NASA shows Hurricane Florence from the International Space Station Sept. 10, 2018, as it barrels toward the U.S. East Coast. More than a million people have been ordered to evacuate parts of the southeastern U.S. coast as a powerful hurricane barrels toward the shore. Mandatory evacuation orders were given to parts of the states of South Carolina, North Carolina and Virginia as forecasters and officials urge people to prepare for devastating winds and heavy rains from hurricane Florence. The National Hurricane Center says it expects the storm to make landfall late Thursday into Friday as "an extremely dangerous major hurricane." Florence is a Category 4 hurricane with maximum sustained winds of 215 kilometers per hour and forecasters think it will gain more strength. It is the most powerful hurricane to threaten the region in nearly three decades. A Category 4 storm is capable of ripping roofs off houses, snapping or uprooting most trees, bringing lasting power outages and making areas uninhabitable for weeks or months. Florence is expected to drench areas along its path with 38 to 50 centimeters of rain. President Donald Trump signed declarations of emergency Tuesday for the Carolinas, a move that frees up federal money and resources. Trump told reporters in Pennsylvania "we are absolutely prepared" for Florence and acknowledged the storm could inflict heavy damage. Jeff Byard of the Federal Emergency Management Agency said the hurricane will not deliver "a glancing blow" but a "direct hit onto our coast." He added that "this is not going to be a storm that we recover from in days. At the same time Florence is expected to make its landfall, another storm, Isaac, is forecast to be at or near hurricane strength as it moves across the Lesser Antilles and into the eastern Caribbean Sea. 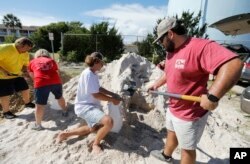 South Carolina Walker Townsend, at right, from the Isle of Palms, S.C., fills a sand bag while Dalton Trout, in center, holds the bag at the Isle of Palms municipal lot where the city was giving away free sand in preparation for Hurricane Florence at the Isle of Palms S.C., Sept. 10, 2018. The NHC expects Isaac to weaken to a tropical storm by Friday and Saturday as it moves near or south of Puerto Rico and the Dominican Republic.